The Hotel Hershey is one of America's landmark hotels, offering 276 guestrooms and 25,000 ft2 of meeting and function space. Located on a hilltop overlooking Hershey, Pennsylvania, the 1930s hotel was built by chocolate magnate Milton S. Hershey, inspired by Mediterranean trips with his wife, Catherine. In the hotel, historic photographs line the halls and each guestroom features original artwork. Outside, panoramic views of the gardens and Hershey valley punctuate this world-class resort experience. 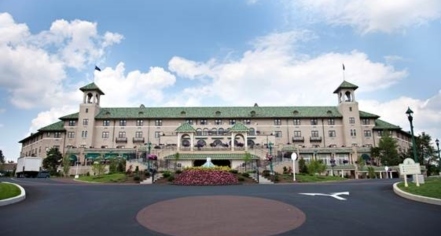 A family-friendly destination, The Hotel Hershey affords deluxe accommodations, including the intimate guest cottages, an expansive recreation complex, a collection of boutiques, and authentic culinary experiences at a variety of dining establishments. An official resort of Hersheypark, The Hotel Hershey grants convenient access to the iconic theme park which boasts over 65 rides and attractions. Guests of The Hotel Hershey can also indulge in spa services and treatments at The Chocolate Spa and access to three distinctive golf courses. The resort is truly an elegant destination that is fun for the whole family, right in the heart of Hershey, "The Sweetest Place on Earth." The Hotel Hershey, a member of Historic Hotels of America since 1991, dates back to 1933. 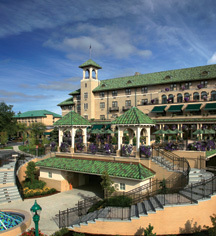 The Hotel Hershey is part of a world-class resort destination located in central Pennsylvania. Airport Transportation: Airport and train station shuttle service, may be arranged through the hotel's concierge, rates apply. Cancellation Policy: A one night deposit is taken on all reservations. A guest can cancel within 72 hours to receive a full refund. Guest can change dates within 72 hours of arrival time without a penalty. Occupancy Restrictions: Up to 4 guests. Shuttle Service: Complimentary shuttle service to the Hershey Attractions may be scheduled through the resort's concierge. Transportation: Vehicle rental is available through the Concierge. Local transportation complimentary, based upon availability. The Hotel Hershey is one of America's landmark hotels, offering 276 guestrooms and 25,000 ft2 of meeting and function space. Located on a hilltop overlooking Hershey, Pennsylvania, the 1930s hotel was built by chocolate magnate Milton S. Hershey, inspired by Mediterranean trips with his wife, Catherine. Learn more about the History of The Hotel Hershey® .